A knockout punch is an electrician's favorite tool for making new holes in an electrical box or panel. A knockout punch set gives you the choice of many different sizes of knockouts. Classic manual knockout punches are operated with a socket wrench. There are also heavy-duty knockout punches that use a hydraulic pump, but these are overkill for most residential wiring. Most punches will cut through mild steel up to 10 gauge, plus stainless steel, plastic, and fiberglass. The alternative to a knockout punch is to use a hole saw and drill, but a punch makes a cleaner hole with less effort and noise. Drill a hole through the material, using a drill and metal-cutting bit. The hole must be sized for the draw stud. Small draw studs are usually 3/8" in diameter, while large studs may be 3/4". Fit the appropriate size of die onto the draw stud, then insert the draw stud into the pilot hole. Thread the desired size of punch onto the draw stud and hand-tighten it to the backside of the material. Turn the draw bolt with a ratchet wrench; this pulls the punch toward the die. Keep turning until the punch cuts all the way through the material. Separate the draw stud and punch and remove the little ring of waste material lodged inside the die. This is called a slug and usually is split in half by the punch, giving this kind of punch the nickname "slug-buster." The best tool for drilling the pilot hole for the draw stud is a step drill bit. This cone-shaped bit drill holes of a variety of sizes and are made for sheet metal and other thin materials. Self-tapping or self-drilling step bits don't need a pilot hole to get started. If you've ever drilled a hole in metal you know it can be impossible to drill a large hole without using a pilot hole or making progressively larger holes. 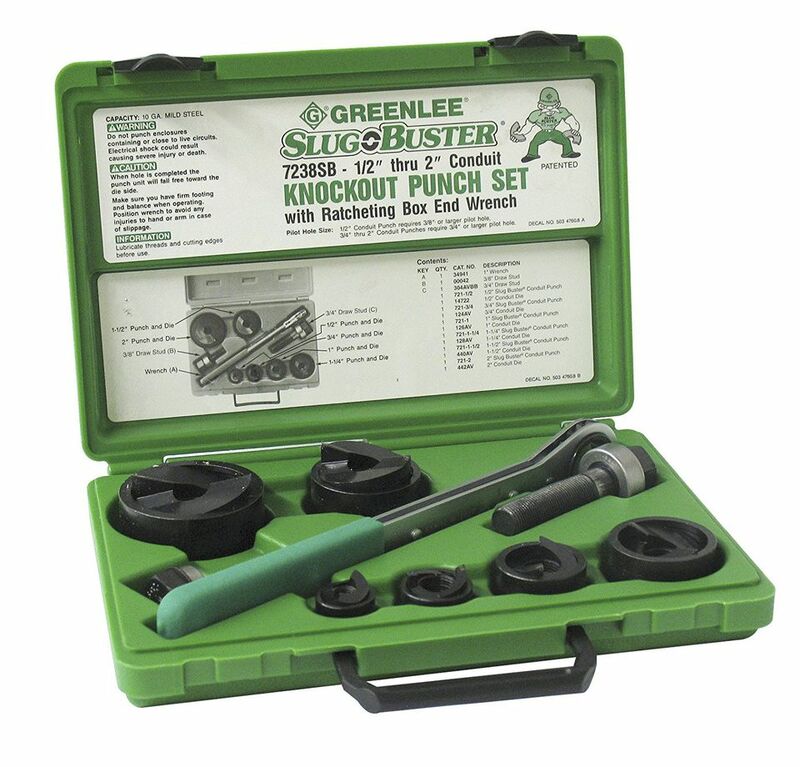 Some knockout punch sets include a ratchet wrench sized for the draw studs in the set. This is handy to have because the wrench and punches are always in the same place. No searching around for a standard ratchet wrench and socket or having to resort to an adjustable wrench in a pinch. A good standard set of knockout punches comes with punches for 1/2", 3/4", 1", and 1 1/4", sometimes up to 2", and includes a small and large draw stud. Larger sets cut holes like 2", 3", 4" and larger but may require a different punch for each sized hole. This Drill Is Outdated. But It Still Might Be Worth Buying.